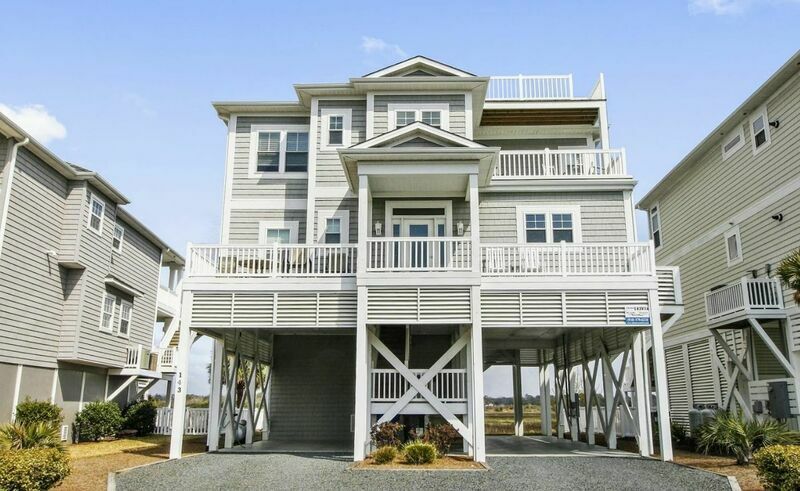 From your well-appointed back deck enjoy sweeping views of the marsh, sound and the ICW, while the front porch allows views all the way to the Atlantic Ocean! This private home is located on the desirable west end of Ocean Isle Beach in the private Islander Resort community. NEW IN 2019 POOL ON THE PROPERTY WITH VIEWS OF THE SOUND. Accommodates 12 people in this two story, 4 bedroom, 3.5 bath home. The ultimate in a comfortable vacation home with two master suites each with a King size bed, and luxurious full size bathrooms. There are two bedrooms connected to a jack and jill bath, one bedroom will have a queen bed, the other bedroom will have queen and a double bed. The loft area will have a pull out sofa which is a double. A television is in each bedroom. All bed and bath linens are provided in this rental. Two pack 'n plays are available for your little ones. Bedding: King, King, Queen, Queen/Double, with a Full Sleeper sofa in upstairs nook. Gorgeous kitchen with stainless steel appliances, quartz countertops and ample dining space with a large gathering table and breakfast bar seating 6 additional guests. Gather your family in front of the beautiful fireplace on those chilly nights and enjoy our open concept living area with large flat panel television, DVD player and comfortable living room furniture. Other amenities in this upscale home include hardwood laminate floors throughout the main living space, ceiling fans throughout, microwave, washer/dryer, outside shower, sun decks, private dock for fishing and crabbing (water not deep enough for boats); grill, covered parking, high speed wireless internet access, 5 flat panel cable televisions, 5 DVD players, whole house audio including the rear deck accessible from your kitchen, family room and back deck....and so much more! Non-smoking. Weekend stays available in the off season. NO LINENS PROVIDED FOR WINTER MONTHLY RENTALS. **3 night rentals available in non-prime weeks. From your well-appointed back deck enjoy sweeping views of the marsh, sound and the ICW, while the front porch allows views all the way to the Atlantic Ocean! Had the most wonderful thanksgiving with family and enjoyed some great football...wish we were going to spend this thanksgiving together in this beautiful ocean isle home...hopefully will stay again in a few months. This house was absolutely incredible!!! Beautiful sweeping views of ICW, marsh and sound with views of the Atlantic ocean from the front porch as well. So warm, cozy and incredibly comfortable...This home had absolutely everything!! Had such a special thanksgiving with our family in this breathtakingly beautiful home! !